Those morsels of bread, cookies or crackers can be a cook’s best friend – if you master their power to add texture and flavor to foods. Cooks around the world have. They use crumbs to crisp-coat meats in Austria (Wiener schnitzel), Italy (alla milanese or alla parmigiana) and Japan (tonkatsu). Crumbs add body to Spain’s gazpacho as well as Greece’s taramasalata and skordalia. And they bring personality to a dish that might otherwise be downright dull. So think of crumbs as more than annoying leftover bits scattered across a table. Know their secrets, then let them work for you in savory and sweet dishes. Imagine a plain pork chop, fish or chicken cutlet, cooked sans coating. Could be lovely. Could look and smell delicious. Now imagine it breaded and cooked with a perfectly crisp exterior. The coating seals in juices, and those browned crumbs create another level of flavor, thanks to the Maillard reaction, a complicated process involving heat playing with amino acids and sugars. There are three key components to breading success. “The Science of Good Cooking” – by the editors at America’s Test Kitchen – explains: “flour (or some flourlike substance); an egg wash (or something like it); and breadcrumbs (sometimes toasted, ground cereal or crushed crackers).” Pat the food dry first, then apply each element with a light hand in the order listed, starting with the flour or cornstarch. Let the coated food rest to set the breading before deep frying or pan frying. If coated correctly, the starches and proteins will glue everything together. Crumbs can change up the textural interest of casseroles, say, adding a crisp finish to mac ’n’ cheese. Sprinkle plain or toasted crumbs atop vegetables, from roasted cauliflower to halved tomatoes. Or get creative, mixing crumbs with melted butter or herbs, spices, garlic, grated lemon rind or umami-rich grated Parmesan. Don’t limit the crunch power of crumbs to appetizers and entrees, though. Crisp cookie bits transform potentially dull desserts. A simple pudding or custard or mousse takes on star quality, layered in parfait glasses with crumbs and whipped cream. Baked fruits (apples, rhubarb) become crumbles when topped with a crumbs-sugar-butter-spice mix. And when crushed cookies are pressed into crumb-crust service, their crisp texture and buttery flavor play well with tangy Key lime or cheesecake fillings. The variety of crumbs, whether made from bread, cornflakes, matzo, crackers or corn chips, will influence the flavor of a dish, of course. But even plain white breadcrumbs have flavor power. Plain crumbs are often used to stretch the flavor of ground meats or fish (think meatballs and fish cakes). When breadcrumbs are toasted, their flavor deepens – it’s that Maillard reaction again. Consider the role of breadcrumbs in a classic Italian preparation that begins by toasting crumbs in olive oil before tossing them with cooked pasta. They add crunch and, by absorbing the dish’s elements, help extend those flavors. Julia Child suggested using crumbs to bulk up fillings and absorb moisture, a job they do well in soups and stews. The late, great chef didn’t invent the concept, of course; she just supported the body-building power of breadcrumbs that has been popular since medieval cooks began thickening sauces that way. Spain’s traditional gazpacho would just be a thin, watery tomato-cucumber soup if a bit of white bread weren’t allowed to soak up and dissolve in that mix. In Greece’s taramasalata, breadcrumbs bulk up the fish roe dip, in much the way they work in the garlicky spread called skordalia. In Provence, breadcrumbs thicken the garlicky-spicy sauce called rouille that’s served with fish soups. And in Britain, the classic bread sauce that’s often served with roasted poultry begins by infusing milk with onion and spices (cloves, bay leaves, peppercorns, etc. ), then relies on breadcrumbs to soak in the milk, letting the starches swell and thicken the sauce. It’s in meatballs and meatloaf that crumbs exert crucial influence. When those crumbs are mixed with milk (a starch-liquid mix called a panade), then worked into ground meat, the mix will “keep ground meat moist and tender and help meatballs and meatloaf hold their shape,” note the America’s Test Kitchen editors. Better that than a brick-hard meatloaf or dense meatballs, right? Credit the milk (moisture) and the crumbs (starch) for keeping the meat proteins from clumping together. Credit crumbs for making eating more interesting. • Panko: Use these flaky Japanese-style breadcrumbs for coating meat or seafood. • Dried breadcrumbs: Use these very dry or toasted crumbs for coatings or lightly buttered as a topping. • Fresh breadcrumbs: Use these soft crumbs for meatballs, fish cakes or stuffings. Which crumbs you use in cooking will depend on the job the crumb needs to perform, as well as personal preference. Fresh breadcrumbs are popular for coating foods, though some cooks prefer using dried crumbs. Others opt for the flavor cornflakes offer. Those who favor the Japanese crumbs called panko cite the lighter coating they produce. Each has a slightly different texture. And when lightly browned in a skillet or on a baking sheet in the oven (yes, it’s that Maillard thing at work again), the toasting deepens their flavor, adding another dimension to a dish. Supermarkets offer a variety of crumb products: plain, seasoned, cornflake, cracker, panko, matzo and gluten-free. Sweet crumbs may be made from graham crackers, chocolate wafers, vanilla wafers and gingersnaps. Whichever crumbs you choose, make sure they’re fresh, which is why many cooks prefer to make their own, because nothing ruins a great dish like stale crumbs. • To make fresh breadcrumbs, remove crusts from bread slices that are a day or two old; French or Italian breads with good body are preferred. Tear up the slices and drop them into a food processor. Pulse gently to cut into crumbs; you can also use a blender. For fine crumbs, sieve them through a fine strainer. For coarser crumbs, rub torn up pieces of bread between your fingers. • To make dry breadcrumbs, take those fresh breadcrumbs you just made, toss them onto a rimmed baking sheet. Dry them in a slow oven, 250 degrees for 15 minutes. Don’t let them brown. • To make cookie crumbs, put cookies in a food processor and pulse. Or place in a resealable plastic storage bag and crush with a rolling pin. 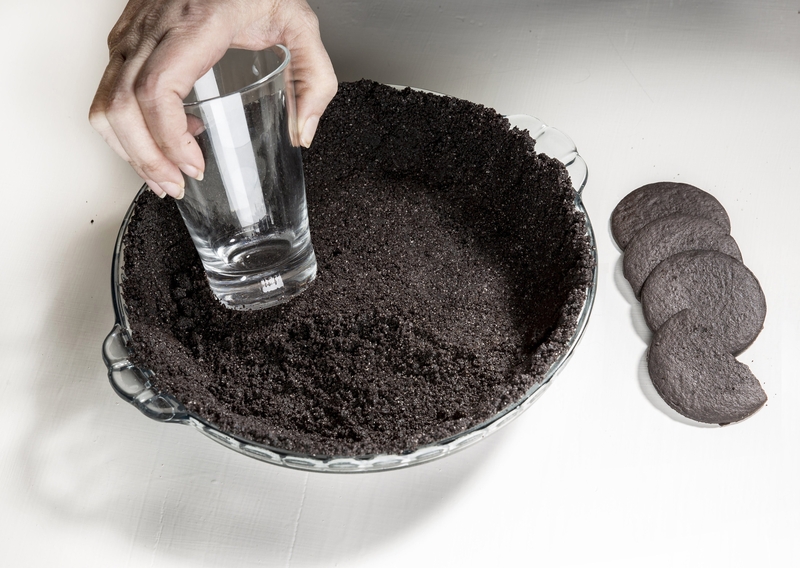 For a 9-inch crust, you’ll need about 1 cup cookie crumbs and 2 to 3 tablespoons melted butter (just enough to hold the crumbs together when you gently squeeze them in your hand), plus about 1 tablespoon of sugar (depending on the sweetness of the cookies and filling). Press the mixture into the baking pan. Then bake 6 to 8 minutes in a 350-degree oven before cooling and filling with a pudding, mousse, cheesecake mixture or ice cream.